As summer camp directors, we've long known that camp is much more than just a vacation, more than just a sum of the activities. Summer camp is unique. The right camp isn't just fun, but can help your child learn essential social skills: independence, self-confidence, and self-esteem - all important building blocks that help your child grow into a happy, healthy, well-adjusted adult! We've all met someone, whether child or adult, who appears socially awkward. They seem hesitant, perhaps even afraid, to interact with other people. We're sure your heart goes out to them, as ours does, for the discomfort they feel. Fortunately, feeling awkward or not knowing what to say is not like your shoe size--you can change it! Being socially adept is a learned skill. It's learned by watching others and by trying and sometimes failing. This is where summer camp can help, and in particular sleep-away camps. It's hard to imagine anything more social than camp where a child lives, eats, sleeps, and plays 24/7 with others. There is a nearly unlimited opportunity for interacting with others. 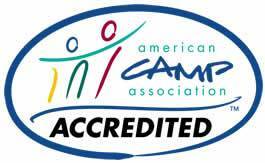 Unlike school, where there may be only one teacher for every 20 to 30 students, accredited camps typically have one carefully selected and well-trained counselor for a small number of children. The counselors not only provide a role model, but do so 24/7. They're present and during those uncomfortable moments they can help a child with suggestions on what to say or do. And camp strives to provide an emotionally safe environment as well, where mean-spirited criticism has no place. So if a child says something awkward, they're less likely to be mocked. Feeling safe makes it easier to take chances. So summer camp really is the ideal place to work on building social skills. As much as we may wish that our kids would always remain children, they just keep getting older! And as parents, we know that ultimately our role is to help our children grow up and learn to become independent. A sleep-away summer camp provides a safety-conscious and supportive environment for children to branch out and learn to live, eat, sleep, and play away from mom and dad. This simple first step can have a profound effect on children, and parents can feel at ease that their children are being well cared-for. Time and again parents report that their child has come home from camp having grown up a little more, and having displayed a greater sense of independence and confidence. How can someone be happy and well-adjusted without having confidence in their own abilities and feeling good about him or herself? Obviously, they can't. Self-confidence and self-esteem are essential components for becoming a happy, well-adjusted adult. Summer camp helps children increase their self-confidence by allowing them to try new things, develop skills, and overcome challenges in a supportive and caring environment. With each new skill and success comes more confidence. Learning to hit the target at the archery range, overcoming a fear of heights at the challenge ropes course, or paddling across a lake for the first time are all skills and successes that directly boost a child's confidence. Feeling capable, in turn, helps children feel better about themselves-to increase their self-esteem. And those camps that provide additional opportunities for children to contribute in various ways, whether distributing mail to campers or helping activity specialists set up an activity, further help children to feel they have something meaningful to contribute and that they are needed. Feeling that you have something meaningful to contribute and are needed are magic for building self-esteem. We encourage you to talk to your child and together find the summer camp that's just right so that your child will not only have fun but will enjoy a summer that can be so much more than just another vacation!